Trainspotting first graced our cinemas in 1996, however, it took me another 20 years to finally watch the cult classic. Ridiculous I know as a prior film student, but it took a fantastic film marathon at a friend’s house for me to finally sit down watch it. Trainspotting is arguably one of the most powerful representations of the drug culture, unique owing to not only its refusal to be set in a glamorised format but also because of its unconventional manner, such as the film’s poster. Trainspotting explores a profoundly dark and seedy narrative, with scenes made from the stuff of nightmares, but with what I can only imagine to be realistic scenarios when things inevitably go wrong. The two things that resonated with me after watching Trainspotting were the remarkably intelligent design of the film. How the director Danny Boyle used the sets, the music, and the atmosphere to create what one would imagine to be a realistic depiction of the inside of a drug users mind. Boyle, along with the cast and crew, created something really quite profound, and importantly something that I hadn’t seen before nor have I seen since. That, and McGregor’s performance. Now, I grew up watching McGregor in the Star Wars Franchise, in fact, I believe it was the first place I saw him, I would, of course, grow up to see him in classics such as Moulin Rouge! Watching him in Trainspotting was quite blown away by his performance, how authentic he both looked and behaved. A performance I sadly haven’t seen him once replicate to that same level of intense believability. So, though I have no plans to revisit the first film, it is seared onto my brain as one of the more authentic films I have witnessed. So, I suddenly found myself aboard the hype train along with every other Trainspotting fan, and I have waited with baited breath to watch T2. With the DVD release this week I finally had my chance. T2, as you are all probably aware, takes place 20 years after the first film. Why 20 years? Well because Danny Boyle wanted a certain amount of time to pass before once more exploring the lives of Renton, Spud, Sick Boy and Tommy. At least that was Boyle’s reasoning when he appeared on Graham Norton’s show with the rest of the cast. A statement I initially doubted, given how many reboots, sequels and prequels have been both released and are currently being made. Having now watched T2, I’m even more sceptical regarding the necessity of its creation. The first half this film is great, much like a gap between seasons of your favourite TV show, it’s fascinating to see how these characters have changed, where they are, what are they doing and in Trainspotting’s case, are they all still drug addicts? What is initially striking is how bloody good they look, considering the sheer volume of drugs they must have ingested, injected, snorted and smoked, they ought to resemble someone closer to Keith Richards (A legend who I hugely admire, before any fellow Stones fans start heckling me). Richards looks appropriately fitting for someone to have done all he claims, he has earned those lines in his face, lived those tales he describes in his book and has earned that classic rock star attire thus cementing him as the real deal. McGregor, despite a double-take opening scene, looks incredibly baby-faced, as does Jonny Lee Miller as Sick Boy. In fact, in one scene that was used for publicity, the pair are seen walking through a farmyard, looking not out of place if the location had been swapped for a Californian beach, even the attire might be fitting with local trends. Though I must say my favourite moments of the film are when Brenton first reconnects with both Sick Boy and Spud, a realistic, brutal and disgusting couple of moments that call to moments in the original film. Once the narrative moves beyond the halfway point, the narrative really struggles to keep the momentum going. With scene after scene beginning with some bizarre moments such as Brenton and Sick Boy performing in a country make-shift fan club where Renton and Sick Boy must steal money, only to conclude on quite a funny note with a healthy portion of nostalgia applied. So, there are moments of genuine hilarity and entertainment mixed with some insightful moments, and these moments are best summarised by Sick Boy when, in one scene, he discusses the concept of nostalgia with Brenton. Sick Boy highlights with a degree of unexpected clarity and articulation not only their own trapped predicament in life but also the basic concept of the film “Where will you go next in the nostalgia of your childhood”. This theme of continually flashing back to the original film and beyond to the group growing up together is something the film relies a little too heavily on, through very carefully edited scenes. Frustratingly the final act of the film leaves you not only with a number of unanswered questions, but it also chooses a jarringly conventional ending for a film famous for doing the exact opposite. The film ultimately suffers from its inability to impact in the same manner in which the first was roaring success. Though there are glimpses of the old magic, such as Brenton making a decent effort of commenting on modern society through his “Choose Life” moment. I know it’s perhaps not fair to compare notes, however, the theme of nostalgia is so heavily relied upon it’s quite hard not to do so. When I watched the first Trainspotting film, I was totally gripped, immersed in a story of such impressive filmmaking and an honesty about drug culture I have not seen since I was taken aback when the film ended. It is after all only just an hour and a half while T2 is closer to a full two hours, something it doesn’t suit. 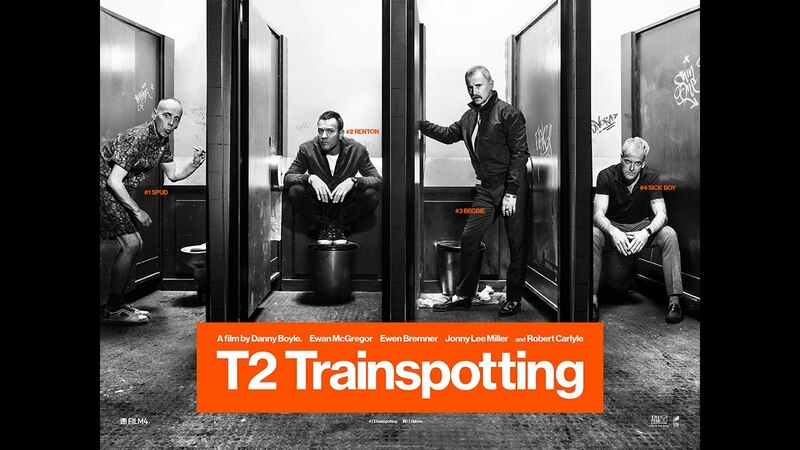 T2 then is the poor man’s Trainspotting, one that lacks that same mix of horrific and euphoric moments. The honesty and emotional depth are perhaps better articulated, but as this film examines a middle-aged crisis rather than teenage angst it’s one that sadly leaves the film feeling closer to a generic blockbuster. OVERALL- *** Danny Boyle knows how to stylistically create these films, play with the locations and music, but T2 lacks the impact the first one delivered so powerfully. Had there been a greater focus on the second half, tighter editing and a reduction in time from nearly 2 hours to the time of the original, then perhaps this would have served as a worthier sequel to the cult classic. RECOMMENDATION – I was expecting something more from this film, which began with the correct intentions but never quite followed through.